A wee tour of Cashel’s nursery. I wanted it to be neutral – or at least easy to transition for future children – but also to feel like a home for a boy. This lead me to ultimately decide against a formal theme and just went for a color scheme. I focused on mustard yellow, sage green, and teal as the accent colors and used the gray wall color and white wainscoting as a clean slate to begin with. Thanks to my talented husband who painstakingly put up the wainscoting and built a new window sill and trimmed in the window. Here’s what we came up with for our wee boy. 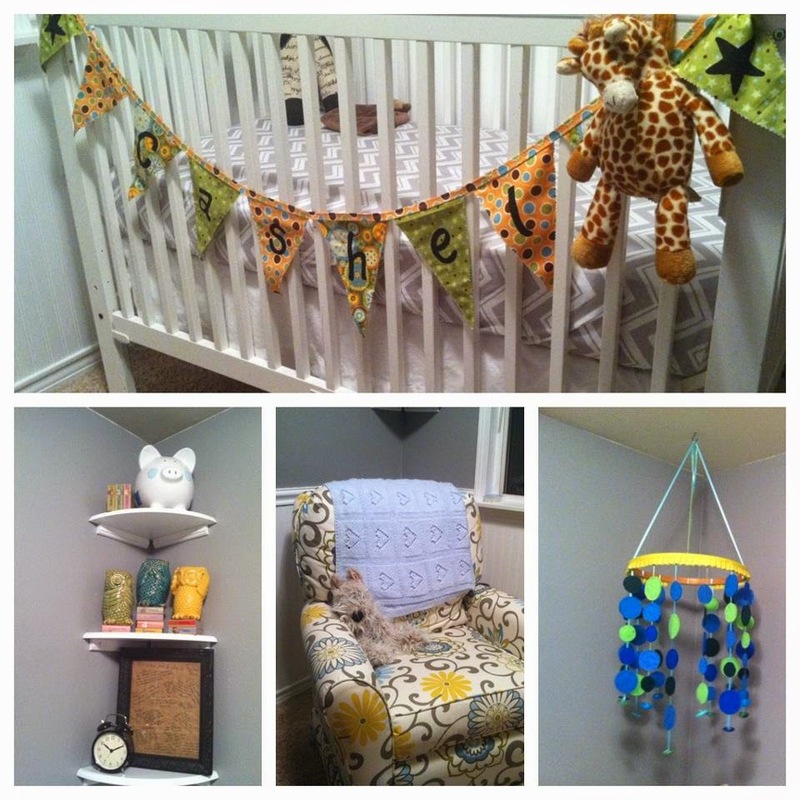 The name bunting was made by a friend and really made the room feel complete. On the corner shelves we have a couple of fun and special pieces. The piggy bank on the top shelf is from Cashel’s Great Grandmother whom we affectionately call “Er-Nannie.” The “Hear no, See no, Speak no evil owls” we picked up on our fourth anniversary trip while in Leavenworth, Washington. Couldn’t resist as they are the exact colors we have in the nursery. 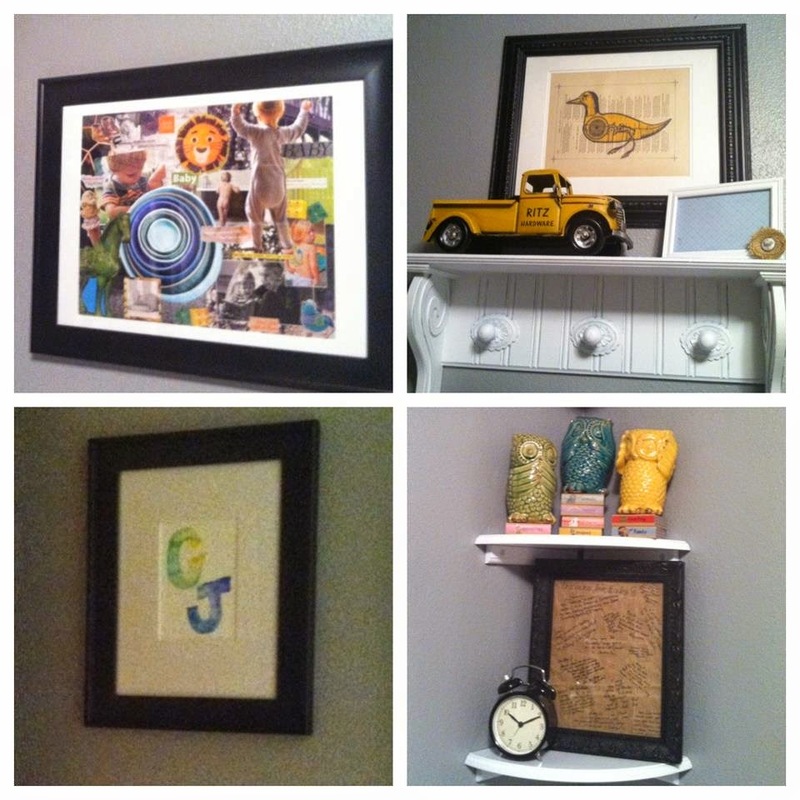 On the bottom shelf is a piece of “art” we created at our “Waddle it be?” gender reveal. Guests wrote special notes to “Baby J” who was not named yet. The nursing chair was my 2012 Mother’s Day and birthday gift from my husband and he picked it out all by himself. Well done Benjamin – I adore it. 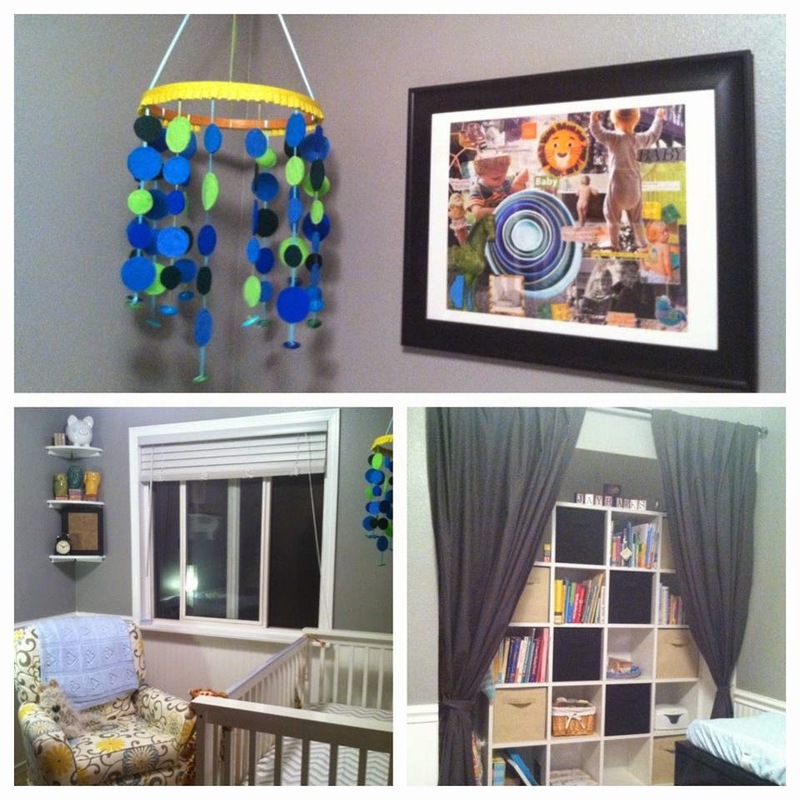 The felt circle mobile was Pinterest inspired and I made it with my Mom during that infamous “nesting” phase. The beautiful collage art was made by my husband’s sister Emily and incredibly enough she didn’t even know the nursery colors and it is absolutely PERFECT! Here the bottom left is a watercolor of Cashel’s initials that my cousin made for him and above the shelf is a special piece of duck art given to Cashel by my sister. The little blue and white frame says, “I love you because…” and is for sweet little messages to write to Cashel. The room as a whole is small but the closet organizational system is priceless. We were given it by a local doctors office and I got the cubes on sale! 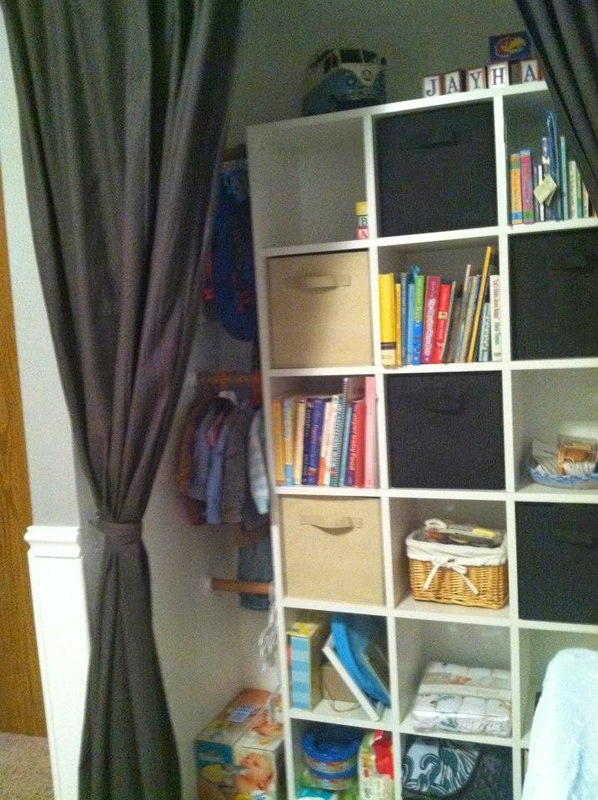 Hides so many things and provides so much additional storage. The custom hanging rods were fitted between the wall and the shelf. My husband is so clever and it was a quick solution to needing a bit of room for hanging clothes. He got the fixtures at a local hardware store and we just used the existing closet rod that he cut to size. 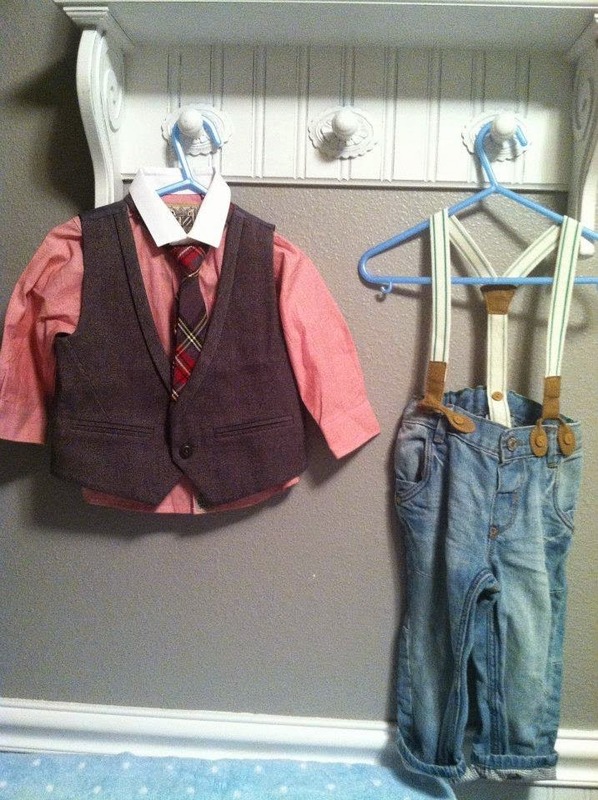 Some adorable outfits my Mom got for Cashel while she was in Ireland! 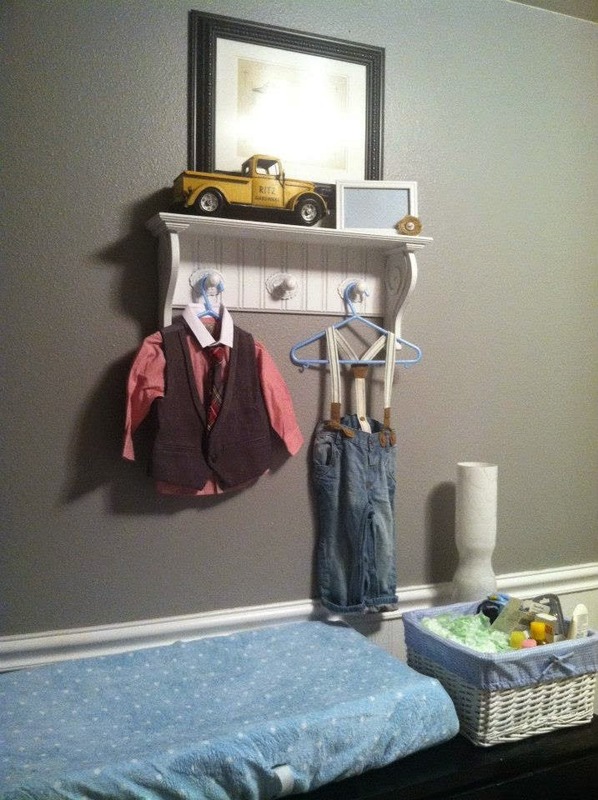 We used a dresser to house clothing, cloth diapers and the top as our “changing station.” In the little basket on the right – which is now on the left – there are diapers, diaper cream, a few binkis and other materials you need on hand quickly. Behind that is a lamp that I use in the middle of the night so I don’t have to turn on bright overhead lights. 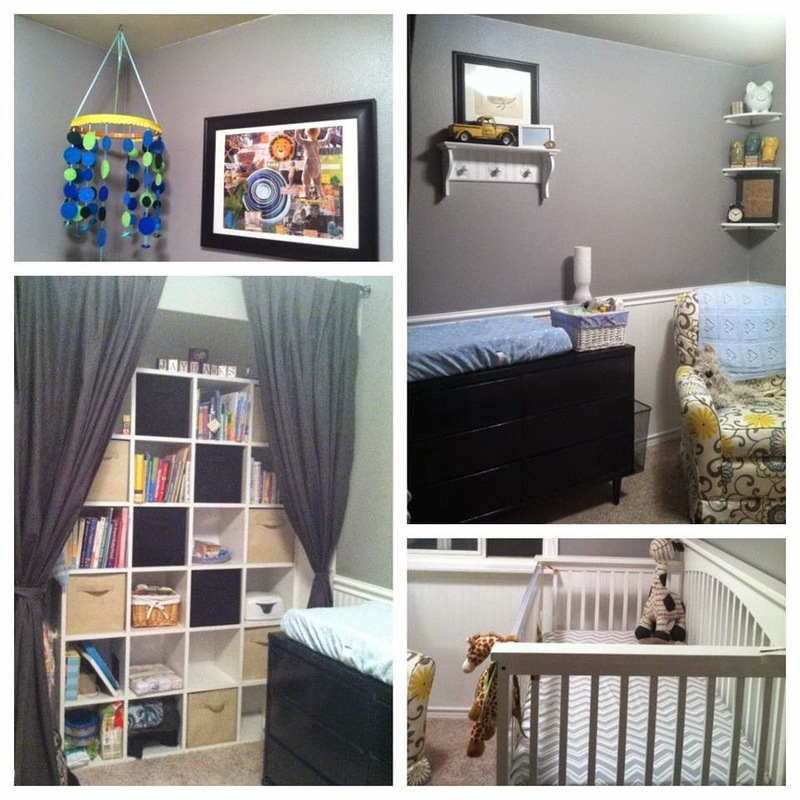 UPDATE: A few notes now that Cashel is here and I’m using the nursery in a more practical way. 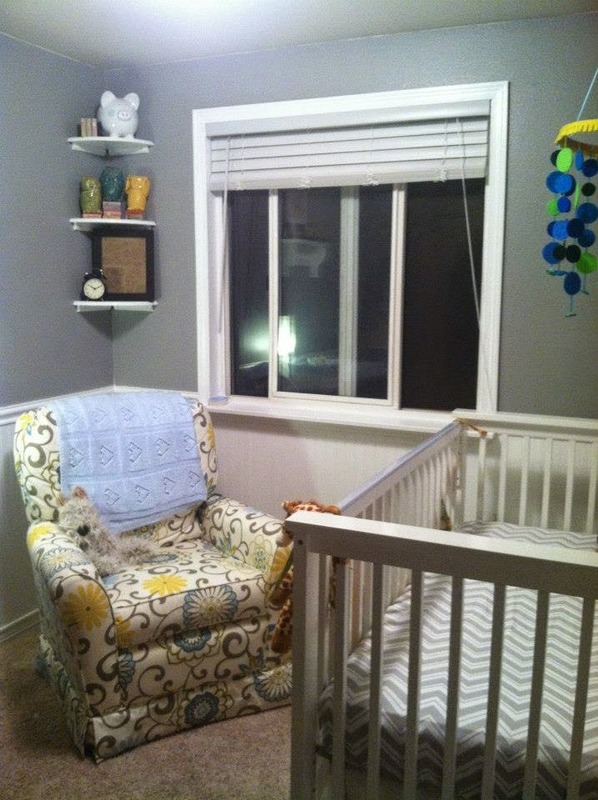 First, I hear many people express that they don’t understand why the nursery needs to be set up before the baby’s arrival because they don’t sleep in the room. 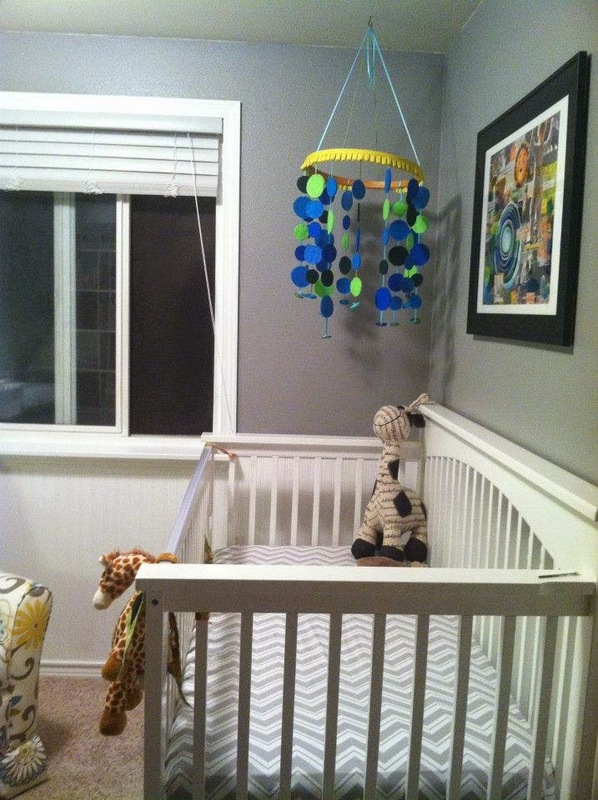 For us I use this space every night as I take Cashel from his bassinet to our nursery (that is nice and close) to nurse. That way I have everything I need and don’t have to wake up my husband who works in the morning. 1. The changing materials are now on the left side with a wipes warmer that I found really nice while Cashel was really small. On the left I found it easier to access as a right handed person. 2. I got an additional side table to go between the dresser and the nursing chair that now houses the lamp and nursing essentials. It is about 3 feet tall and only about 6″x6″. I stained it a nice dark gray color. 3. I also added a kid-friendly mobile to the crib that is wonderful. It’s an umbrella a projects lights up onto the umbrella and plays music. He loves it! It was a hand-me-down from a friend with four boys and it’s truly used daily. Plus it’s directly above where Cashel sleeps. 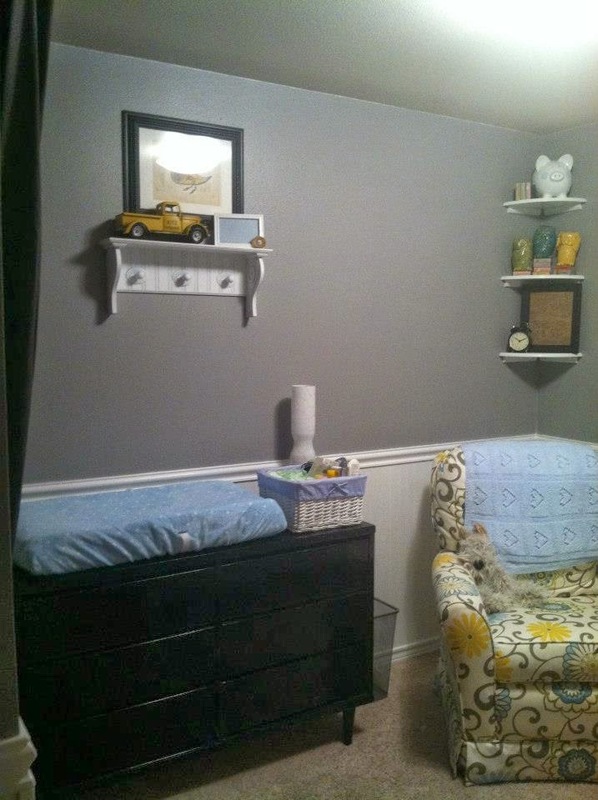 See Cashel’s BIG boy room reveal here. what was the wall color you painted the blue? It is actually a gray. I can ask my husband. 🙂 We ended up using it in my parents living room and a friend used it in her living room. It's a great "warm" color while still being gray.